Ensuring that your bathroom remains accessible to you no matter the circumstance is a great investment in the value of your home and peace of mind with regards to bathing safety. Thousands of people are injured in their bathrooms every year due to an accidental slip or fall. That number is staggering considering the cause. We want to help you avoid sustaining an injury due to careless bathroom design. That’s why our topic today is to tell you what we believe are some of the best ways to improve the safety and accessibility in your bathroom. Assess Your Needs: The first step to any project is to assess your needs. We advise a simple walk-through and in-depth observation of your bathroom to determine where potential hazards exist. Many times, an accidental slip or fall occurs when entering or exiting the tub. Secondly, it’s important to consider any current, future, or potential issues with mobility. If you have trouble stepping over your high sided tub day after day, then a walk-in tub or step-through insert may be just what you need. Determine Budget: Once you’ve determined what you need in order to create a safer and more accessible bathing space, you need to determine how much you’re capable of spending. This can be harder than it seems since many types of remodels can seem a bit pricey at first. However, when comparing the price of a simple remodel to what a serious injury may cost, the best option tends to become clearer. Review Viable Options: After assessing your needs and budget, you can begin looking at your best options. There are numerous safe bathing apparatuses and accessories available so it’s not terribly hard to find the best ones for your bathroom. Walk-in Tubs: A walk-in tub is one of the most popular safe bathing systems available. They have an easy access entrance with a leak-proof swinging door. They are great for providing a deep soaking bath experience without sacrificing safety. Furthermore, many come equipped with hydrotherapy jets to soothe your aching muscles and joints. The downside is they tend to be less affordable than many would like. Tub-to-Shower Conversions: Remodeling your high-sided tub to a convenient, low-threshold shower can give you peace of mind when it comes to your bathing experience. This option eliminates the potential of tripping over a high-sided tub wall when going to take a shower. However, a tub-to-shower conversion also eliminates the bath so if you enjoy the feeling of a relaxing bath, then a conversion may not be for you. Step-Through Inserts: Step-through inserts are an affordable work around for homeowners that don’t want to sacrifice their bath for safety. They are less expensive than purchasing a walk-in tub and can be custom fit to practically any bathtub. The main concern with this system is that it limits the depth of your bath since it requires removal of a section of the upper half of your tub wall. Safety Grab Bars: Safety grab bars are another affordable safety accessory and can greatly aid homeowners when entering or exiting the tub or shower. Shower Pedestals: This safety accessory provides homeowners with support when lathering up in the shower. 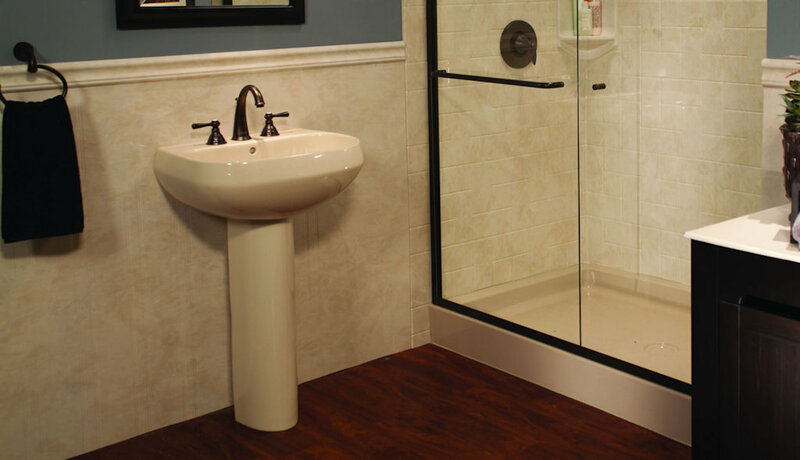 Barrier-Free Showers: Barrier free showers are perfect for those that have issues stepping over any type of threshold. Best of all, they can be customized to be wheelchair accessible. At Bath Makeover of Arkansas, we employ some of the most courteous and knowledgeable bathroom remodelers in the industry. Each of our representatives is more than happy to help you find the perfect accessible bathing system for your home. Don’t let an accidental fall in your bathroom leave you distressed, contact us today so we can help you avoid a treacherous fall!